Photo: Westend (Main House), ca. 1849, Route 638, Green Springs Historic District, Trevilians, Louisa County, VA. Listed on the National Register of Historic Places in 1970. Photographed by Jack E. Boucher, 1983, Historic American Buildings Survey [HABS VA-1233], memory.loc.gov, accessed November, 2013. The Louisa County administrative offices are located at 1 Woolfolk Avenue, Louisa, VA 23093; phone: 540-967-0401. 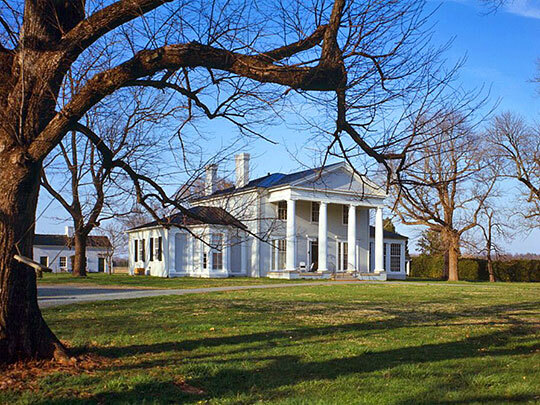 The county was established in 1742 and named for Princess Louisa who was the daughter of England's King George II and Queen Caroline and the wife of Denmark's King Frederick V.
Ashley Neville and Sarah Clarke, Ashley Neville, LLC, Mineral Historic District, Mineral, Virginia, nomination document, 2004, National Park Service, National Register of Historic Places, Washington, D.C.